Hoarding owns the hoarder. The owner of excessive items is unable to sever the tie with the objects he or she collects. Cluttering may be a marker of a hoarding disorder, but an individual can accumulate numerous, somewhat related objects for several reasons. Collecting is an organized display of items appreciated by the collector and may serve as a recreational hobby. An individual suffering from hoarding disorder will gather several mismatched items and store them in the home for infinity, or until a concerned member of the family or neighbor gets help for the hoarder. The hoarder will not let go of a single item, whether it is a series of used ketchup packets from decades ago or several newly purchased ladles. In fact, the hoarder will have stocked away 40 ladles within the recesses of the home. There is no system in place that dictates what the hoarder will gather. Fast food receipts from five years ago and empty plastic cups are fair game to hoard. In cluttering, a person will accumulate items that have personal meaning. The objects are gathered and stored in a non-thematic fashion. Generally, any items are kept in the home’s basement or attic without much regard to organization. A collector will gather specific items that revolve around a theme, like stamp collections, wine collections or baseball card collections. These valued possessions are carefully displayed inside the home. Someone with a hoarding disorder allows the accumulation of miscellaneous hoarded items to take over the home. The hallways are littered with garbage; the home’s exits are barely accessible due to the excess rubbish; stairs are unreachable; and, rooms overflow with collected trash. The home of an individual with a hoarding disorder is immersed in bacteria and is dangerously unsanitary. Imagine canine waste contained in a jar or cat litter piled up in the corners of several rooms. 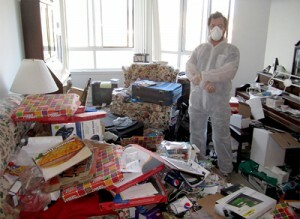 A person with hoarding issues retains harmful items that eventually create a toxic environment. People with clutter in their homes typically store accumulated items in the basement or attic, where the objects have little impact on the everyday household functioning. Hallways are litter-free and easily accessible, as are exits and entrances. The rooms in the home are used as intended, meaning the bathtub is not overflowing with accumulated paper bags. Those with clutter in the home easily straighten out the mess when necessary, such as when guests arrive. Collectors beam with joy at the tasteful display of their collections, whether they be porcelain figurines, train models, glass blown vases or unique paperweights. The home’s aesthetic appearance is enhanced by the presence of exquisitely presented collected items. A homeowner takes great pride in showing off the collections. The home is not haphazardly overtaken by the collector’s exhibits. Hoarding is a chronic psychological disorder. 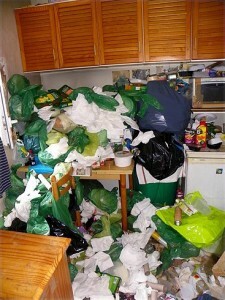 Approximately two to five percent of the population has been diagnosed with a hoarding disorder. Researchers refer to psychological parallels between hoarding disorder and obsessive-compulsive disorder (OCD), ADHD or dementia. The individual suffering from a hoarding disorder experiences psychological distress at the mere thought of parting with an item hoarded within the home. As a way to avoid experiencing the stress, the hoarder does not let go of a single hoarded item. Social isolation plagues many with a hoarding disorder. Relationships are strained due to conflicts with neighbors and family members. Financial worries become a stark reality when the individual excessively spends money on irrelevant objects. Cluttering is generally considered normal. The personal items gathered invoke pleasurable emotions, like joy or pride. Varying degrees of clutter exist. Those who step into a cluttered home may feel overwhelmed or simply comfortable with the mess. What one person sees as a sore, sloppy scenario may be commonplace for another individual. Those with clutter in the area do not feel psychological distress when removing the items from the home. Collectors do not experience distress, financial setbacks or work impairments as a result of their collecting habits. Unlike hoarding, where the individual experiences financial woes due to impulse spending, collectors evaluate the items they purchase. A hoarder and a collector may have the same amount of possessions in their homes. The major differentiating factor between the two is that the collector’s home features a systematic organization of the collected items, while the hoarder’s accumulation of castoffs is a chaotic mess. In cluttering, location is significant. An individual with clutter in the home intentionally houses the possessions in rarely used spaces, like the basement. A hoarder’s jumble literally litters every inch of the home. Cluttering can lead to hoarding if the individual is unable to let go of the items or excessively accumulates objects randomly and with no purpose. Problem cluttering may be thwarted if any of the red flags are heeded: repeatedly purchasing the same items because the original cannot be located, accumulation of stuff prevents guests from visiting the home, and complaints arise from neighbors or family members. 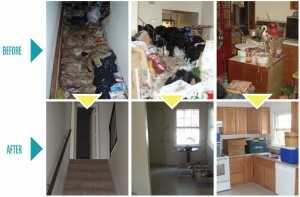 A hoarded environment can be a hazardous situation, with harmful pathogens and bacteria growing in every crevice and surface. If you know a hoarder ready to clean their home, consult a professional hoarding and estate cleaning company, like ServiceMaster Disaster Restoration and Recovery, that services hoarded and cluttered homes. 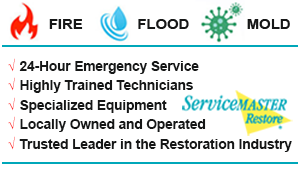 Our trained specialists at ServiceMaster Disaster Restoration and Recovery are sensitive to the homeowner’s plight and carefully handle the situation with tact. Professionalism and experience give our technicians the edge when it comes to navigating the disorderly whirlwind of a home engulfed with hoarded goods or clutter. Our team compassionately works with the individual suffering from the hoarding issue, as well as a therapist or the family members to implement a cleaning plan. We also follow up with a phone call in the short-term to determine whether additional help is needed and if the home is maintained. When dealing with a sensitive issue like a hoarding cleanup, call the most trusted name in professional cleaning, ServiceMaster Disaster Restoration and Recovery. 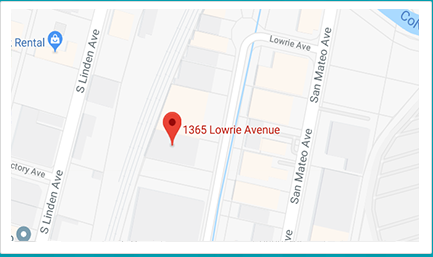 We reliably serve the San Francisco, CA community every day of the year.